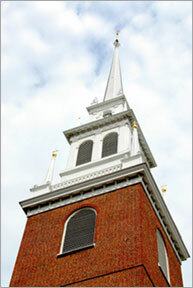 Christ Church in the City of Boston, also known as Old North Church, is the oldest standing church building in Boston, having first opened its doors to worshippers on December 29, 1723. Its 191 foot steeple is the tallest in Boston and because of its prominence would play a dramatic role in the American Revolution. Gen. Thomas Gage had made secret plans to send troops to seize rebel munitions stored in Lexington and Concord and to arrest John Hancock and Sam Adams. The Sons of Liberty discovered the plot and devised their own plan to have Paul Revere and William Dawes warn the countryside of the arrival of the British army. On April 18, 1775 Paul Revere met up with sexton Robert Newman to tell him how many lanterns to display in the church’s steeple to signal how British troops were advancing. Newman then met fellow Sons of Liberty Capt. Pulling and Thomas Bernard. Leaving Bernard to keep watch outside, Newman opened the church and he and Pulling climbed the stairs and ladders up eight stories to hang two lanterns for a few moments. It was long enough for patriots in Charlestown to learn what has been immortalized by the phrase One if by land, two if by sea in Longfellow’s Paul Revere’s Ride. The British were advancing by boat across the Charles River. These lanterns heralded the battles of Lexington and Concord and the beginning of the American Revolution. The steeple has been blown down twice by hurricanes, in 1804 and in 1954. On the Freedom Trail, the Old North is an active Episcopal church today.